Beside the recent developments identified in this chapter, which enabled the dissemination of services in modern society, enumerate other developments which were relevant. Describe the types of digital services the UK government is providing to its citizens. Execute a web search to identify which service industries have a higher market share. Contrast the values found for US, EU, and Asia. Explain how the division of work and labor, and the ownership of resources, are prerequisites for the edification of a service-based society. Compile a list of five distinct definitions for the term service and highlight possible limitations when compared to the definition from Hill  adopted in Sect. 1.2.1. Provide four examples of services for each of the interaction types shown in Fig. 1.6. Can the model of interaction types shown in Fig. 1.6 be extended with additional scenarios? Give examples of services for the new scenarios you have identified. Due to the inseparability of production and consumption, services cannot be “stored”. What techniques, methods, or tools can be used to manage the supply and demand of services more effectively? How can crowdsourcing be used to match service supply and demand more efficiently? Describe two or three services, which could benefit from this sourcing model. Identify and discuss how five well-known companies from various service industries could provide new services using servitization as a differentiating model? Service systems can consist of hundreds or even thousands of components which are the combination of technology, processes, people skills, and material resources. To ease the comprehension of what constitutes a service, their decomposition and the identification of their main parts is important. Decomposition refers to the process by which a complex system is broken down into parts that are easier to understand, systematize, use, and maintain. The goal of this project is to select three familiar services (e.g., library loan, internal IT consulting, e-banking, or cloud services) and to use the capstone model  presented in Table 1.3 to identify their main components. The final report should constitute a precise service manual that can be used by managers for service operation, management, and improvement. Customers. The people that benefit or are affected by the service. Customers can be seen as initiators and receivers of a service. Aims. The goals, purposes, and meaning of the system. Inputs. The inputs to the system. They include physical, human, and informational entities to be handled through the service system. Outputs. The outputs from and effects of the system. They can also include physical, human, and informational entities after being handled in the system. Processes. Processes that are performed by the system. They are the transformations for obtaining outputs from inputs. Human enablers. Human enablers are the human resources that own and/or operate the system. Physical enablers. Physical enablers are physical and technological resources which aid or support the operation of the system. Information enablers. Information enablers are information and knowledge resources that support the system. Environment. The system’s environment which include all the factors that can influence the system. For example, physical, technological, social, and legal factors. These nine major classes are extended to a second level of 75 main classes. At a third level, they are decomposed into 351 minor classes. The fourth and fifth levels include the actual attributes of a service and their possible values. A complete description of the various levels can be found in [55, p. 264]. The major class Customer has the main class Customer Feature, which in turn has the minor class Age, the attribute Age of Customers, and the possible values are: Children, Teenagers, Adults. 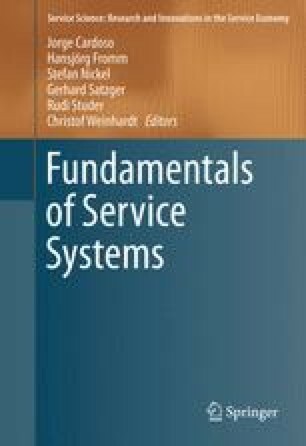 The major, main, and minor classes identify aspects of service systems, which can be analyzed to understand how a service is build and structured to, e.g., increase its transparency as well as discover and highlight the aspects that can be improved. A theory which views service as the focus of economic and social exchange. A service is a change in the condition of a person, or a good belonging to some economic unit, which is brought about as the result of the activity of some other economic unit, with the prior agreement of the former person or economic unit. A basic concept from operations management that represents a service as a transformation (T) process that takes inputs (I), transforms and adds value to them, and provides outputs (O) for customers. A service which is provided without or with little human involvement on the provider’s side. The provider often sets up facilities or equipment that the customer can use to perform a certain task. Services that heavily rely on professional knowledge. An acronym for four concepts often used to characterize services: intangibility (I), heterogeneity (H), inseparability (I), and perishability (P). An approach from the field of demand management which aggregates loads with different demand patterns to take advantage of the statistical effects that reduce variability in the aggregate demand. An approach from the field of demand management which creates artificial incentives for customers to use services in off-peak periods. A strategy that many companies follow to turn fixed costs into variable costs by paying for services only on demand to avoids risks if the company’s business goes up or down. A strategy that a company may follow which consists in adding services to existing core products. The result is an hybrid offering in which products and services are integrated as one bundle. James Fitzsimmons and Mona Fitzsimmons. Service Management: Operations, Strategy, Information Technology. McGraw-Hill, 2013. Christopher Lovelock and Jochen Wirtz. Services Marketing. Prentice Hall, 2011. Mairi Macintyre, Glenn Parry, and Jannis Angelis. Service Design and Delivery. Springer, 2011.